↑ 1.0 1.1 "Taxa above the rank of class". List of Prokaryotic names with Standing in Nomenclature. حاصل ڪيل 8 August 2017. ↑ "Rooting the domain archaea by phylogenomic analysis supports the foundation of the new kingdom Proteoarchaeota". Genome Biology and Evolution 7 (1): 191–204. December 2014. doi:10.1093/gbe/evu274. PMID 25527841. 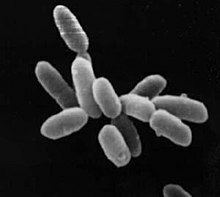 ↑ NCBI taxonomy page on Archaea. https://www.ncbi.nlm.nih.gov/Taxonomy/Browser/wwwtax.cgi?mode=Undef&id=2157&lvl=5&lin=f&keep=1&srchmode=1&unlock. ↑ "Time for a change". Nature 441 (7091): 289. May 2006. doi:10.1038/441289a. PMID 16710401. Bibcode: 2006Natur.441..289P.